Review Acer classifies its Aspire X5900 as a prestige PC and I have to confess that I was bowled over by the looks of this sleek micro-tower. The power button is brightly lit with a white LED, while the hard drive activity light is positioned on the top of the case along with the DVD eject button. It’s all very neat. This is a full system that consists of the X5900, a 20in TFT and a basic mouse and keyboard set. A large part of the limited space inside the case is taken up by the combo DVD drive and 1TB desktop hard drive. The DVD drive is mounted on its side - which isn’t ideal for a tray loading device - and is hidden away behind a spring-loaded stealth cover that helps keep the X5900 nice and quiet. Although the hard drive starts life as 1TB, it has been partitioned as two 500GB drives - 458GB formatted - that are wittily named “Acer” and “Data”. Graphics are provided by the low profile Nvidia GeForce GT 320 PCI Express card, which managed a decent job of playing Far Cry 2 at 1080p. The 20in monitor has a resolution of 1600 x 900 with VGA and DVI inputs so it can manage basic HD duties. But, despite the best efforts of the glossy coating, I was unimpressed by the image quality offered by the screen. 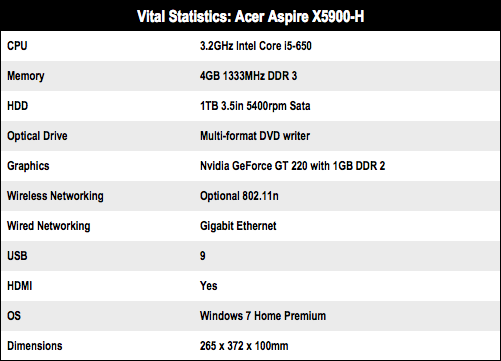 The Aspire X5900 is perfectly capable of playing HD movies, but the lack of Blu-ray drive and surround sound makes that less attractive. 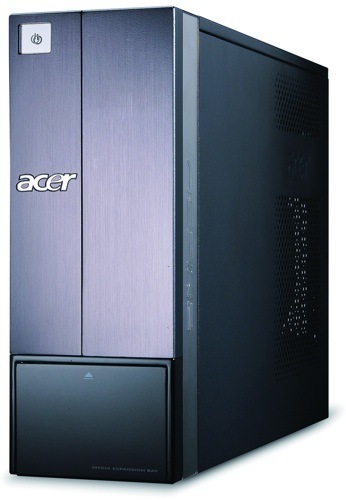 In regular day-to-day duties, the Acer handles the workload with ease.